Born on 7 March 1885 in Montreal, Quebec - son of John Ouimet, St. Rene[? ], Quebec - brother-in-law of Joe Vaillancourt, Wottonmill, Quebec - at the time of his enlistment in 1915: trade as lumberman; single; no current or previous military service; Roman Catholic; height of 5 feet 7 inches; chest of 43 inches fully expanded; fair complexion; blue eyes; fair hair. 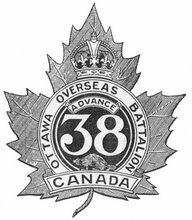 Joined the 59th Battalion, CEF, in Ottawa, Ontario, on 27 May 1915 - transferred to the 38th Battalion, CEF, on 22 June 1915 (number 410847) - served with the 38th Battalion during its period of garrison duty in Bermuda - landed in France with the 38th Battalion on 13 August 1916 - wounded on 27 October 1916 - invalided to England on 31 October 1916 - rejoined the 38th Battalion on 6 March 1917 - wounded on 9 April 1917 - rejoined the 38th Battalion on 30 April 1917 - wounded on 31 October 1917 - rejoined the 38th Battalion on 31 October 1917 - struck off the strength of the 38th Battalion on 5 May 1919.